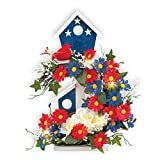 This cool new Americana Lighted Birdhouse is a patriotic wooden birdhouse illuminated with red, white, and blue star-shaped LEDs. It's crafted from kiln-dried hardwood, painted with outdoor paint, and decorated with real pine shake shingles. 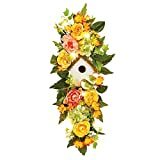 It features a 1.25" opening that welcomes wrens, finches, chickadees and other songbirds and includes perching rails, ventilation, drainage, an unpainted interior, and has a removable back wall for easy cleaning. The LED lighting runs on 3 AAA batteries with an auto-timer that runs 8 hours on and 16 hours off. Sure to make other neighborhood birds jealous. 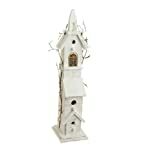 Primitives by Kathy Lighted Chalet Birdhouse, 4.5" x 3.25"